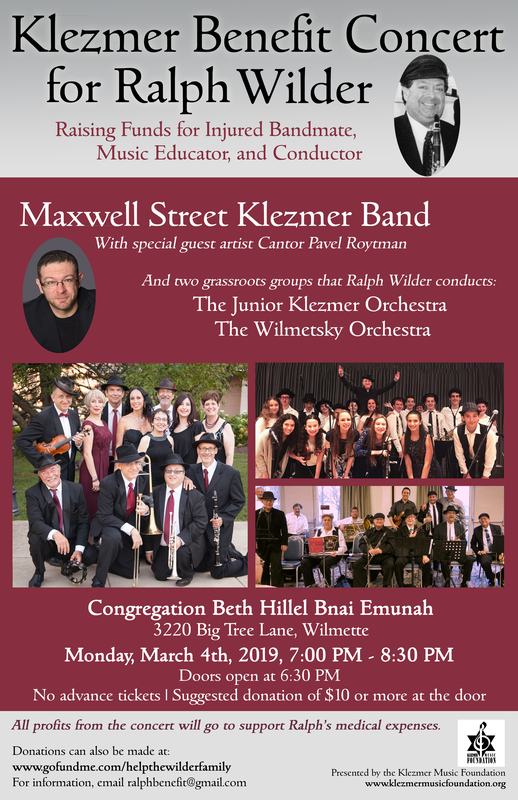 Adapting to life paralyzed from the chest down following a freak accident last May, a local musician, educator and conductor will be honored at Klezmer Benefit Concert for Ralph Wilder on March 4, 2019, in Wilmette. All profits will go directly to Wilder to help cover ongoing medical expenses. The concert will feature rousing performances of Yiddish songs and “Klezmer,” the lively Jewish music of Eastern Europe. In May 2018, Wilder was severely injured when a projector screen fell from the ceiling during a rehearsal at Northeastern Illinois University. Struggling for his life on a ventilator for months, Wilder’s busy professional musical career was cut short by this accident, which left him a paraplegic. ​ Wilder has been a clarinetist in the Maxwell Street Klezmer Band for thirty years, and has also conducted the Junior Klezmer Orchestra and a grassroots klezmer band called “The Wilmetsky Orchestra” for the past decade. Although he can no longer play professionally, Wilder continues to conduct these groups, passing along his wealth of knowledge about the art of klezmer performance. The concert concludes with a showstopping grand finale, with all fifty musicians performing from the stage and their seats, including Ralph Wilder, while the audience dances in the aisles. The concert is presented by the Klezmer Music Foundation, the not for profit organization founded by the Maxwell Street Klezmer Band. For more information, email ralphbenefit@gmail.com.